HomeArticlesAre You an Ancient One? Ancient Ones are Individualized Consciousnesses who made a free will decision to send Beyond Bliss Unconditional Love Energies to a planet in a distant solar system to save humanity from extinction 12,000 years ago, as fully described in minibook #2 of “The World’s Greatest Love Story”. These advanced Individualized Consciousnesses were personally thanked by one of the Great Spirit’s highest level representatives. This representative saw the great leap in evolution and Consciousness they had gained by their Service to Others action, offered them something new in this universe. This opportunity to rapidly expand Consciousness, excited over 100,000 advanced Individualized Consciousnesses who made a free will decision to descend from their Unity Consciousness levels in the heaven of Actuality down into the 3rd dimensional level of hell in Reality and incarnate on planet earth using human physical bodies to create a rapid way for Ascension into the higher dimensional levels of existence to help all Service to Others Individualized Consciousnesses in this universe. Ancient Ones feel different from others, preferring relaxing in high level Love Energy activities. Ancient Ones enjoy being with happy, joyful people. This is why we, Ga Ra and Za Ra, created Love Fests so Ancient Ones could gather each week and enjoy heightened levels of Unconditional Love Energies without leaving the comfort of their homes. Ancient Ones came here to offer humanity the unique opportunity of a multilevel Ascension by giving flows of multilevel Unconditional Love Energies to others. But, due to new age charlatans and the proliferation of wireless technological energies, people are no longer interested in expanding Consciousness using Unconditional Love Energies to help themselves and others. Therefore, we, Ga Ra and Za Ra, created a way for Ancient Ones to use Love Energy Techniques and gain, during one Love Fest, the equivalent of a year of all day meditations in a retreat. Click to read more about Ancient Ones and Love Fests. 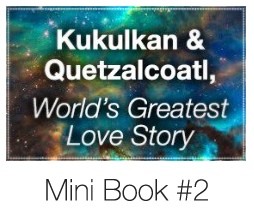 Kukulkan and Quetzalcoatl’s true life adventures fulfilled a 3,700 year old prophecy. Read how they met, married and their honeymooned at the world’s oldest city. Learn about the ETs called Ancient Ones “who help humanity” and the ETs “who fell from heaven”, the ancient truth about Adam and Eve, No-Ah’s ark and much more. Love Fests use a free teleconferencing center so you may call the center directly using your home phone or connect using “Skype” on your computer. We begin each Love Fest with our free form Dance of Light to cleanse our physical bodies and Energy Bodies from all unpleasant energies directed at us by angry people and wireless technological energies. Once cleansed, we perform our free form Dance of Love to fill our physical bodies and Energy Bodies with Unconditional Love Energies. Next, we use a combination of Love Energy Techniques to heal our temporary human physical bodies and our permanent Energy Bodies while also expanding our Consciousness. Then, we use our Love Energized Bilocation Techniques to visit the wonders at 5 separate locations in our Love Energy Sanctuary. Then, we perform a unique bilocation up into the Unity Consciousness levels of heaven. In this way, while our physical body remains in the highest of the 3 dimensional levels of hell, our Energy Bodies enjoy the Joy, Bliss and Beyond Bliss Unconditional Love Energies associated with multiple levels of heaven. Visiting the higher levels of heaven requires one to have at least a 1st and a 2nd level Energy Body. Thus, Love Fests are only open to those who have completed our weekend Activator Class. Love Fests enable Ancient Ones to enjoy happy lives while living in the hell of Reality’s 3rd dimension, because every week, we consciously visit multiple dimensional levels of heaven in Actuality. Click to read more about our weekend Activator Class.